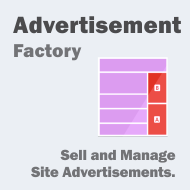 Advertisement Factory is a Joomla Extension that allows your customers to post Adverts (banners, links, keyword highlights and more) on your special set up modules, having attached prices that you will define. In order to test this Extension please login using the buttons above.For clarifications about some functionality please read below. Modal windows adverts. You can set up adverts that will display as a modal popup every X clicks (you can limit this kind of adverts only to unregistered users in order to encourage subscriptions). You can test this feature by navigating in the Main menu in the left for some clicks and the demo popup will appear. Full window adverts. Full page advertisements will interrupt the users browsing and display a full page with an advert and redirect the user after 10 seconds to the original page they were navigating to. This is a technique very often encountered in free content rich websites. You can test this feature by navigating in this demo site - the full page advert will appear after some clicks. Also you can limit this kind of adverts just to unregistered users in order to get users to register. Popup window adverts. The classic advertisement. After you login by using the buttons on the left, you can access the Advertisement Menu where your subscribers can manage the ads they payed for or purchase new ads. They can also see all available advertisement locations, preview their ads, see the number of impressions or clicks. Click around the demo site in order to get FULL PAGE Adverts or MODAL window adverts displayed. Your users can see available spots on your website (like the ones with "your link here" on this demo) and can automatically subscribe to that advertisement position. This automatizes your advertisement and provides a comfortable way for your subscribers to manage their ads on your webpage. You can also test the Administrative backend by clicking on the link on the left or above . For this demo site the payment gateways are setup with dummy account data. In order to test advertisement placing you can manually approve the payment in the Admin Backend. If you have any questions about this product - do not hesitate to contact us !